The Space cast started as temporary miniatures and changed to new permanent miniatures a few comics later. Then so many people wrote to ask for the old Lego figures to come back that I decided to use them as cyberspace avatars when the characters get stuck in virtual reality. 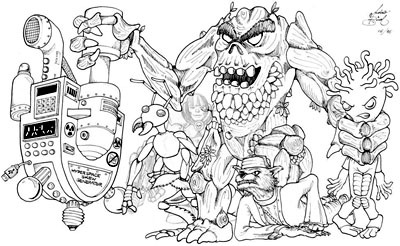 Each cast member is shown with the realspace miniature at left and the cyberspace one at right. Serron is a clever intergalactic merchant. He's seen the rougher parts of the spacelanes and talked his way out of trouble on dozens of planets. Funny how he always seems to get into trouble in the first place, though. He keeps finding other people's property in his pockets. At least they claim it's theirs. You can't trust anyone these days. Iki Piki is a jack-of-all-trades. Well, some. Like diplomacy, and demolitions. He sees no contradiction in these professions. He also has a passing knowledge of xenobiology, law, and nuclear physics. If you need dubious advice on any of these subjects, Iki's your man! He prefers plastic explosive for demolition purposes, and chews gum. He hardly ever gets these confused. Spanners is an engineering and electronics expert. He can make holes in starship engines faster than anyone! He's also handy at computer hacking. He's confused by the fact that in a technologically sophisticated society, security systems and data encryption can still be cracked by a single person sitting at a keyboard, but hey. Quercus is an assistant engineer hired by Spanners as an extra pair of hands in the engine room. He is a tree-being from the planet Fagalia. Although he looks fierce and intimidating, his bark is worse than his bite.